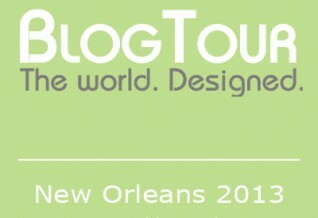 On our first day in New Orleans with BlogtourNOLA, we were treated to a visite guidée* of renowned Magazine Street by local interior designer Shaun Smith, a gracious and most talented young man. Religious symbols abound in New Orleans, a town with a strong Catholic history and culture. One has to keep in mind Louisiana is the only state to be divided into Parishes rather than Counties. Next stop was Gerrie Bremermann’s fantastic shop with Gerrie herself! Gerrie is a lovely and energetic octogenarian interior designer who left her career as a seamstress to become an interior designer in her 40’s. She was voted Vogue Magazine’s top interior designers in 2004. Her boutique/office is refined and personalized. Gerrie is also represented on 1st Dibs. With Gerrie We had a good laugh at how New Orleans affected our hair!!! I so enjoyed my visit with her! Oh, the Bliss of Vacation! I know, I know, I disappeared for a bit. We should all do that once in a while! I took some time off with my family and went to the Berkshires. I turned off Twitter, Facebook, disconnected myself from work including designing and blogging. I had a lovely time. Picked raspberries on a farm (we were instructed to bark here and there to ward off bears, seriously). Ate outside every day. Watched the sunset. Went to a 4th of July parade. Gobbled ice cream with my children. And, yes, went antiquing with my mom in delicious little spots where you need to carefully sift for treasures. They offer great design and sweets all in one. I loved their hazelnut ice cream and the seating was relaxed and inviting to both adults and kiddos. Magnificent ice cream flavors and colors at Sweets and Beans. Smart summer seating at Sweets and Beans. Cool ceiling fixture and assorted candy hanging from ceiling at sweets and Beans. Jars and jars of tantalizing candy at Sweets and Beans. In the 60s, you would drink and eat from these standing up, a little circular ridge on the plate holds the plate. A close-up of their design. I passed on these. I took them home. They make great breakfast plates and tea cups! Collection of parfumerie and soap accessories and containers. Breathtaking sky. Photo by my son, Julien Herpers. I came back to find my collection cherished hemerocallis had bloomed. A treat…. And here is the final chapter of my adventure at Brimfield, which I better post today as I have tons of news to share with you next, from my latest trip to New York, where I attended the Blogfest 2012 event. Pandora de Balthazar Linens and pillows. Embroidered pillows at Pandora de Balthazar. Gilded antique chair and embroidery in front of lace curtain. And now for Part 2 of my exhilarating adventure at the Brimfield Show! Early 18th Century American Chair in excellent condition. As seen at Quiet Corner Antiques‘s tent. Old signs and cycles. Signs were hot and selling like baguettes in a French bakery! Metal furniture and anything industrial was coveted, such as this little crisscross table. Reclaimed grain sacks make fun decorative elements at Ornament Home. I fell hard for this beautifully designed bed by Pascal Home. Lovely sofa in lush grape colored velvet. These white plastic chairs were already tagged “SOLD” on Friday. Beautiful vignette showing a slice of wood on stand and a glimpse of a great carved sign with gold lettering in background. I thought the painted lozenges contrasted nicely with the rounded body of this armoire piece. I leave for Blogfest2012 this weekend and will be back with the final chapter of this Brimfield Series next week!